Homemade sausage is the best, right? You might be thinking of making sausage at home. And with that, you might also need a sausage stuffer. In order to make the best sausage at home, the best sausage stuffer should be considered. Good to know that you can have wide options that are available in the market today. 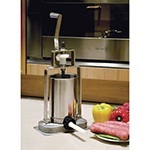 Here, I’ll be providing you a buying guide and reviews of the top options when it comes to sausage stuffer. A sausage stuffer is a device which assists in the stuffing of meats into intestine casings. Though this process could be done manually, it would be a lot more efficient to consider doing it with a sausage stuffer since you could maximize the packing of the meats. 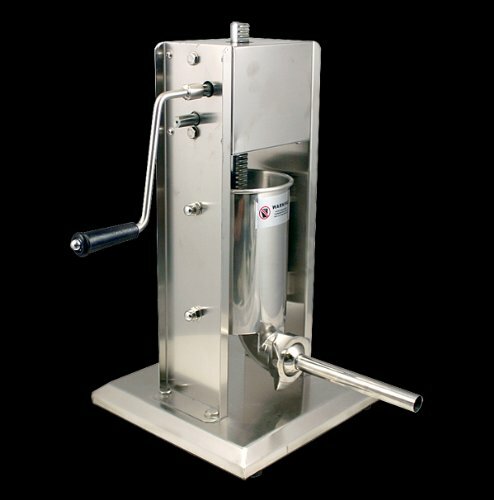 In addition, it is also a great piece of equipment once you need to make sausage in frequent and large batches. This device has come a long way from being a rustic, big and heavy piece of equipment. You could also choose between electric and manual, commercial heavy and lightweight and vertical and horizontal orientations. Indeed, it would be very exciting to make your own sausages at home. Horizontal Sausage Stuffers. This type comes in both electric and manual models. There is a piston-like cylinder that is mounted horizontally is being used in order to hold the seasoned ground meat. This one has a capacity of 5 to 25 pounds. Horn Sausage Stuffers. These types are traditionally made from cast iron being covered with chrome or tin and they are operated manually. 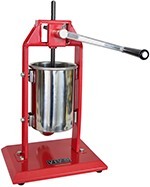 These are being purchased by those who are new when it comes to making their own sausage since they are limited to the production of only 3 to 5 pounds of sausage. Vertical Sausage Stuffers. These types are preferred by both the beginners and professionals as they come in both electric and manual models. The electric models offer larger capacity and commercial grade units. 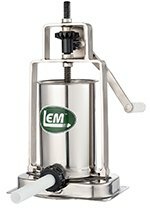 They also have a large piston-like cylinder that holds the seasoned ground meat, however, the stuffing cylinder is vertically mounted. This type ranges from 5 to 15 pounds. Quality. You really need to make sure that the stuffer you are to buy meets the global safety standards and is recognized and verified by the IECEE. This is considered as the only recognized quality control organization all over the world which checks the conformity of the products to the safety standards. Warranty. Since kitchen equipment could be sensitive to damage and accidents, make sure that you are covered with a warranty for at least a year. And also, the warranty must not just cover the parts but also the services. So, read the fine print. Electric or Manual. You have to make a decision whether you want an electric or manual stuffer. 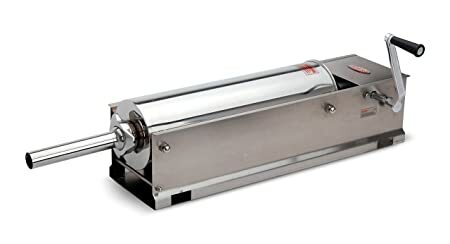 Manual stuffer feels a lot more authentic, an electric stuffer could help you once you want to make sausages a lot often or if you are planning to make big batches. Vertical or Horizontal. Choose between horizontal or vertical stuffer. Shorter people might buy horizontal one since vertical one might be too hard to use. 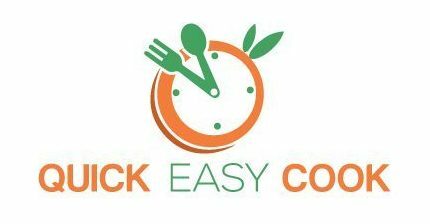 You have to consider comfort and ease to use so try pushing and pulling the device once you visit the kitchen store. Bear in mind these things as you shop for a sausage stuffer that will match your needs and preferences. Always consider your safety first. Choose a sausage stuffer with safety features. It is important to consider reliability as well. Make sure that you choose the one with good track record when it comes to great performance. Once buying a sausage stuffer, maintenance is a great thing to consider. The unit should be easily maintained and cleaned. It’s essential that you do some research too. With this, you will come up with the best choices. It is an investment to buy a sausage stuffer. So, choose a unit with spare parts available and the one that is affordable as well. The one with a warranty is also a wise choice. Speed. Though you don’t have a sausage stuffer you could still make sausages. But, would you want to spend the entire day or afternoon yet getting the same result? In most cases, sausages won’t be filled enough making them a sub par product after. 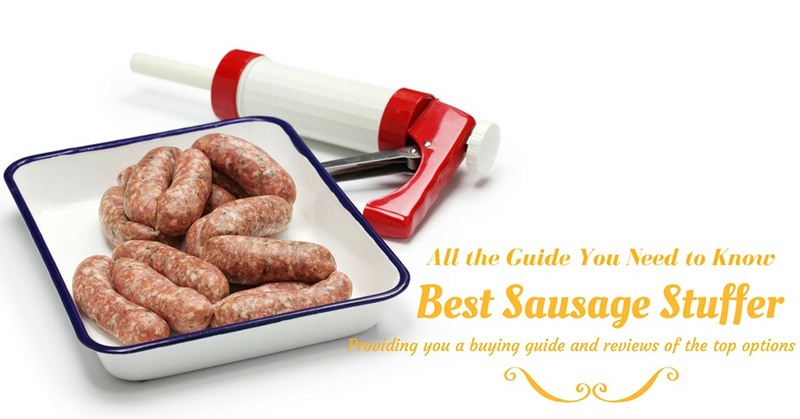 A sausage stuffer could let you make sausages a lot faster but with better results. Versatility. 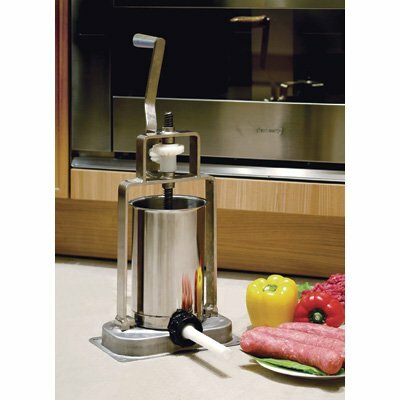 With sausage stuffer, you will never have a reason to waste meat again. Indeed, you could make and also freeze sausages, therefore, will let you save money and less waste is produced too. Flavorful. You could make your sausages a lot more flavorful than those sold out there. You might as well save a lot of money. Options. And you can use the same appliance if you want to make lunch meats, pepperoni, bratwurst, and other meat-filled goodies. You only need to change the nozzle and you can make other options of delicious meat treats. You like to experience these benefits, right? Then choose the best sausage stuffer now! If you love eating homemade sausage, you should also know the fact that filling the casings could be hard. So, I included this product and make it on top because of the fact that it is so easy to use making stuffing a lot of fun instead. With a weight of 9.8 pounds, this product is built with solid stainless steel along with two-pronged base gears. This stuffer is a manual machine that securely fits in place due to its sturdy and solid base. There is this assurance when it comes to ease of filing as well as cleaning and thanks to its plug-and-play cylinder structure. LEM product is so easy to clean due to its removable parts which you could scrub and soak. This product also comes with 3 different sizes of stuffing tubes allowing you to make almost everything from skinny little breakfast links up to huge sausages for cooking out. However, you might find the piston that is made of plastic to be susceptible when it comes to temperature changes, stains and cracking. The horizontal design of this stuffers leads this one to be included in this list. You will be amazed by how the features of this product perform. Hakka features two speeds allowing you to find your groove once in the lower speed and bump it up if you want a maximum production. This unit can definitely plow through a large amount in record time. You can even stuff almost 75 pounds of sausages without experiencing any problem. This device is built for high platforms and to provide an ease of use to almost any kinds of the countertop. Though it’s a bit heavy, it is considered as an electric stuffer rendering solid feel and no bumps will be experienced as well. But, there is a need for you to keep the device moving the moment you begin stuffing a sausage. It might quickly spin counter to you if you release the handle as you are in the middle of stuffing. Known to be a very impressive unit, New VIVO sausage stuffer is indeed portable and durable. Who wouldn’t want to include this one on this list? Some other machines would need to be bolted on the table or to a piece of wood, this unit could only be clamped directly to the countertop. It has a design which allows the cylinder to be slipped out intended for a more thorough cleaning. It has a plastic piston which comes with an air-release valve making the process of stuffing a sausage a lot more enjoyable. You will also love the fact that the entire unit even the metal gears are all built with stainless steel. This unit can definitely handle stuffing efficiently. But, be wary about its price as this one is known to be an expensive stuffer. The strength of this stuffer lies on its durability. A product that is made of full stainless steel along with having a thicker base for stability deserves to be included in the list. Known as a manual stuffer, it features an easy to use plunger suitable to those beginners when it comes to sausage stuffing. The simplicity of the mechanics makes this product loved by the majority. It has a pretty straightforward structure and it is not hard to check once problems happen. On the other hand, this unit might provide you a plastic piston without a warranty. If looking for a device that could allow you to quickly do the job, you must not forget this one from the list. For a faster stuffing of sausages, this one performs at its best. This New MTN sausage stuffer is a perfect option if you need to quickly move sausage through the machine and also clean it between uses. Why? Well, simply because of the fact that it is easy to fill and so simple to clean too. 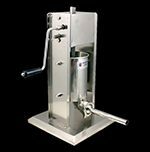 It features stainless steel pressure-relief valve making you not worry about the blowing casings to open therefore leading to a faster process. And this one is designed for commercial use so this can definitely last for a longer period of time. But if you are on a tight budget, you might find the price of this product a bit expensive. However, it is still worth the money since it will plow through huge piles of meat and could definitely withstand the test of time. And for the final choice whether which one is the best sausage stuffer, I would go with LEM Products 5 Pound Stainless Steel Vertical Sausage Stuffer. So why do I considered this as the best? Well, it offers the metal gears as well as components that could be sterilized easily along with a design that is so simple and easy to clean. I would also consider its tilting canister as a great asset if ever I want to work with a large amount of meat. And other great features of this choice makes me decide for this one to be on top of the competition. How about you? Have you already decided which one to choose? I hope this guide and reviews could help you through your decision-making process. But, always take note that you have to buy a sausage stuffer that best fits your sausage stuffing needs and preferences as well. Please feel free to share this article to help others decide as well. For any questions or suggestions, don’t hesitate to share your thoughts below.